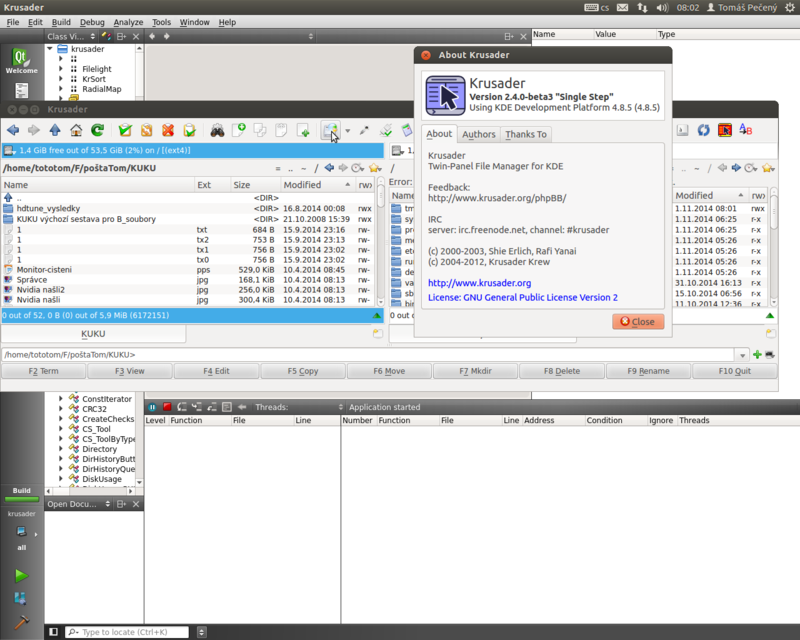 I frequently use Krusader (Version 2.4.0-beta1 "Migration") file manager. It seems I have done something (mouse drag?) that resulted in a completely empty (white) Krusader window except for its title bar. Restarting the PC does not solve it. 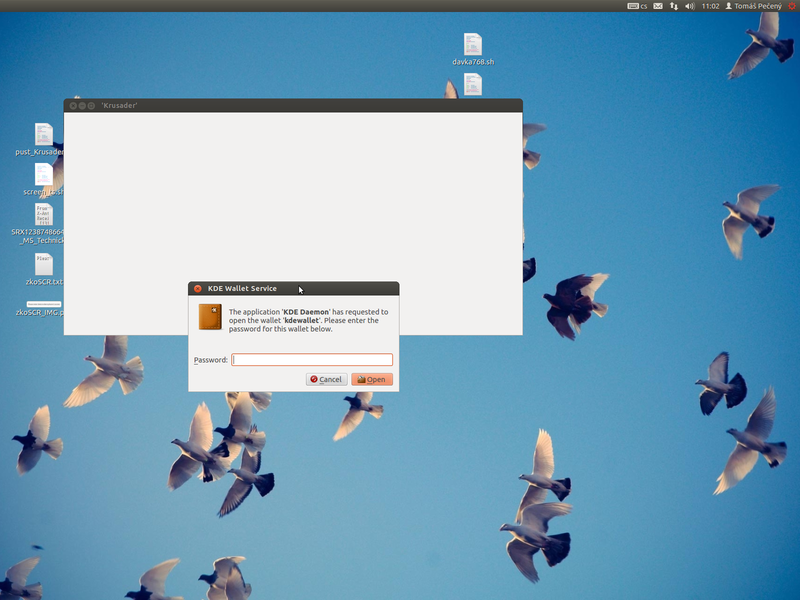 Even reinstalling Krusader from the Ubuntu Software Center did not solve it. I have a relatively fresh clonezilla copy of the Ubuntu system partition; do I have to use it for the purpose? What I must not do with the Krusader to avoid such crashes? May it be caused by a graphics driver? My system and the display after launching the Krusader. After entering the password, the KDE Wallet Window disappears. After restarting the PC (after an Update Manager action) only the red icon on the right above the display whitens. Krusader still behaves as described. The behavior is a matter of the system state of the concerned PC (at the following pictures, running debugger of an other Krusader version at both the PCs is shown. ): I have two identical PCs. One of them bleaches Krusader. The other does not bleach Krusader, now. I suspect that the graphics driver is not fully compatible with my system, because both the computers have recently started to show a oscillating picture when waking up from the "suspend" status in Ubuntu (not in Windows). I tried to install a newer Intel 82865G graphics driver. 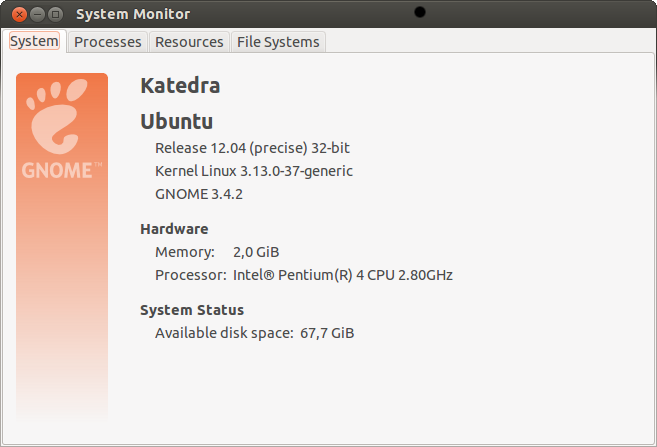 I have not found it prepared for Ubuntu 12.04. I upgraded the system of the PC with bleached Krusader to Ubuntu 14.04 and used the intel-linux-graphics-installer_1.0.6-0intel1_i386.deb from Intel's site; it installed a further repository. I understand that it should yield new drivers. I have updated the system with Software Updater. But Krusader remains bleached also after PC restart. I also tried to use the disk from the other PC. 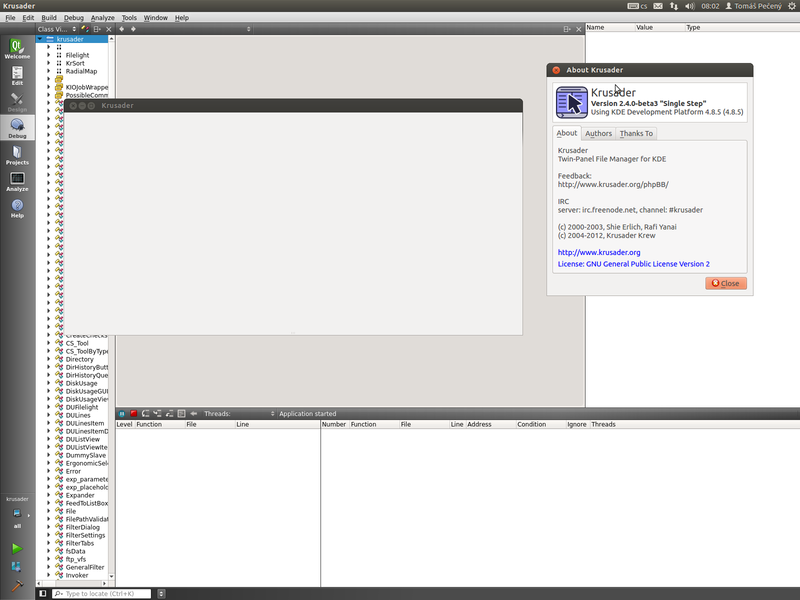 In the Ubuntu 12.04 the Krusader works OK, so the graphics hardware has not failed. This older PC wakes up OK from the "suspend" status, as did both the other PCs some time ago. Now, I see Krusader bleached on the older PC, too: I caused it by trying to look at the content of a directory while Krusader copied several GiBs from another PC. The Krusader window remained white after clicking Pause, too. But another instance of Krusader worked OK at the same time. After restarting the older PC the Krusader remains bleached and another Krusader instance called from an other Terminal is bleached, too. krusader(5824)/kdecore (KLibrary) findLibraryInternal: plugins should not have a 'lib' prefix: "libkonsolepart.so"
krusader(2584)/kdecore (KLibrary) findLibraryInternal: plugins should not have a 'lib' prefix: "libkonsolepart.so"
I have found that on my machine, hitting Ctrl+F (toggle full screen terminal) in krusader leads to that same completely white krusader window - and it stays that way until you hit Ctrl+F again. If it happens again: give that a try. For one of my PCs, that now uses the Nvidia graphics card, the bleached Krusader starts to operate normally after setting all the the Krusader user settings to defaults. A good idea is to note everything that has been set. Then run the Krusader Konfigurator and for all items (Panel, General, ...) click the Default button and confirm the action. For a yet older Pentium III HP Compaq using its integrated graphics only, the treatment helps, too. Not the answer you're looking for? Browse other questions tagged 12.04 krusader or ask your own question. How to reset Krusader configuration to defaults / remove corrupted config file? Why are all videos jerky on an Intel 845G graphics controller in 12.04?